If you are looking for an in-depth exhibit on the eruption and the excavations that unearthed Pompeii, however, this isn’t it. Instead, it aims to educate the viewer subtly on the decorative arts that adorned the pleasure palaces of the rich. It’s a quietly haunting way to bring their lives back. 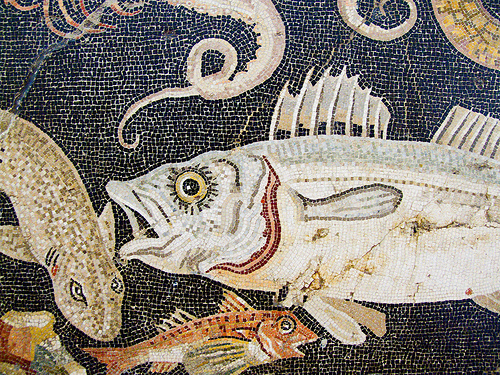 Busts of the imperial family, including the usual suspects of Augustus, Livia, Caligula and Nero, are on display, as are gorgeous mosaics and frescoes, still lifes showing the bounty of the sea and land that groaned on Roman tables. One of the most impressive recreated rooms is a triclinium, or dining room, its lurid red walls depicting Apollo and the Muses. I could imagine many a fun party there, guests raising drinking vessels like the silver kantharos, intricately entwined with olive branches. But I think my favorite piece was the stunning bronze statue of a girl fastening her dress. It seemed austerely modern, powerful in its simplicity, the living eyes a real shock and impossible to look away from. Somehow it made me think of every girl the morning of that day, quietly dressing, with no idea of the horror to follow. 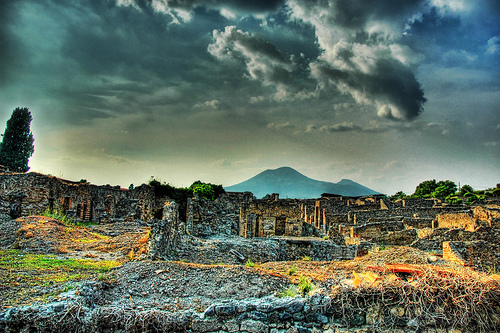 I definitely want to check this out, as well as the real Pompeii! I checked this out a few weekends ago. It’s a really, really, interesting exhibit. There’s a tour guide, slightly overweight guy with a booming voice that absolutely made the trip worth it.